To be blessed is to receive favor, protection or good fortune in a way that we don’t perceive as having been earned. A blessing is given freely by the Universe or the Divine and is beautifully named as Grace. I feel so deeply blessed to be here in India studying the profound subject of Iyengar Yoga at our home institute here in Pune. Despite a few mishaps in getting here, everything is now going extraordinarily well. On my past trips to India, I have felt much more anxious. This time, I feel relaxed and more able to go deeply within myself. I am not sure why it feels so different. Perhaps it is just that I have more experience and greater familiarity with this place. Perhaps having gone through major illness, I no longer get as stressed about everyday things. It is also true that the atmosphere in the hall is very different without Guruji. His presence filled the space and added an element of intensity that is no longer there. Yet his grace and blessings linger to uplift and guide us. Geetaji is also not practicing in the hall due to her ill-health, so that also creates a big shift in how the space feels. Yet students are working with focus and sincerity, receiving the grace of being in this blessed place that Guruji created. My practice time is going well, and assisting in the medical class is very new but also going fine. The classes have been fantastic. 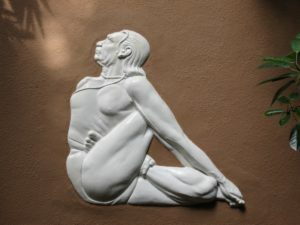 Prashant Iyengar teaches with an emphasis on philosophy and connectivity of body, breath and mind. His use of analogy and metaphor is amazing, and I have embraced his teaching in a completely new way during this first week. While we stay in the poses for long holds, he continually brings our attention to the present, whether we are working on the breath, the elements, or detailed awareness of the sensory organs. I feel his classes are bringing me to a new understanding of what it is to practice yoga. It is amazing to meet and practice with students from all over the globe. My roommate has been to Pune many times, and she has been a wonderful support in all kinds of ways. The flat where I am staying is beautiful, light and airy, and close to the institute. The owner is a kind and gentle man and it is a pleasure to be staying in such a good place. So I am definitely filled with gratitude and the feeling of being blessed. Thank you again to everyone – teachers, friends, colleagues and students – who helped get me here! What a wonderful post Karen!!! As I am blessed and uplifted by your teaching when you are here, I am blessed and uplifted by your edification in Pune. I send you love and gratitude always! Karen, I look forward to your posts so much. Your words seem to indicate that you have let go. Although the term may seem negative it is anything but. It is a beautiful thing to be able to do. Formulated planned expectations can limit precious moments of discovery. So happy for you. Thank you Alice. I am certainly feeling that I am going with the flow.